Posted on February 5, 2016 at 10:00 am. Have you ever noticed the smell of those Glad Kitchen Catchers? After years of use, one day I looked at the box and realized that these bags contain Febreeze. Febreeze is one of those products that is full of fragrance and even contains methylisothiazolinone (MI). And that’s in my garbage bags, releasing itself into the air. We stopped using grocery bags quite a while ago, as they didn’t quite fit the bin, tended to have holes in the bottom, and started to cost us five cents each from the grocery store. What to do? One answer I found was to ask on freecycle groups for used grocery bags. I’d rather not. If I’m getting rid of plastic bags, why continue to bring plastic bags into our house, which last even longer in a landfill than the long-lived compostable ones? Conventional plastic bags are made of PET plastic, or polyethylene terephthalate, derived from petrochemicals. They mostly photodegrade by exposure to sunlight. One study found a way to break them down with bacteria, but it hasn’t been replicated yet, and most bacteria still require oxygen, water, and warmth. When they do degrade, the small bits and the chemicals they contain are free to contaminate water, soil, plants, animals, and humans. We don’t know how long most of them will last because they’ve only been around for 50 years, but estimates range from 20 years to 1000 years to never, likely on the longer side because of the low-light, low-water, and low-oxygen environment in landfills. No, that wasn’t right for us. Compostable plastic and paper bags were the next place I looked. Paper bags definitely don’t hold wet kitchen messes, and they cost $1 to $2 apiece. They also take large quantities of water, energy, and chemicals (including chemicals for wet strength, dry strength, water resistance, and more) to produce. If they break, recycling them takes almost the same amount of resources as making them the first time, but the fibre quality is lower the second time around. 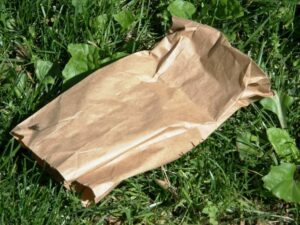 Some “biodegradable” bags are made of a combination of plastic (possibly recycled) and organic matter. They may only partially degrade, provide no guarantee about what they degrade into, and make no claim about how long they take to degrade. Not good enough. “Compostable” bags like Biobag are usually made of corn-based polymer called PLA, or polylactic acid. These bags cost about the same as paper bags. Some are very thin or brittle, and if you leave them too long they can begin to compost in your kitchen bin or leak. Some brands have overcome many of those issues, but that’s not the biggest problem. Most importantly, any of these “compostable” options are useless in a landfill. The amount of oxygen, heat, and moisture in a typical garbage dump, or even in your backyard compost bin, just isn’t enough to cause them to biodegrade. Instead, in a landfill these corn polymer bags, biodegradable bags, and even paper bags can last for just as long as conventional plastic bags! 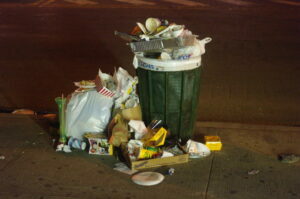 Even when used in city composting programs (for which paper and “compostable” bags may be okay, but not “biodegradable”), the length of time the city takes to compost their waste may not be long enough to break down the bags, or the city could avoid the problem by separating the bags from the food waste and sending the bags to a landfill regardless of your good intentions. None of these were the answer. Use the rest of the kitchen catchers until they’re gone. Dumping them into a landfill unused would be worse than using them up. I won’t be touching the bags themselves or be around when they’re put into the bins. Compost vegetable kitchen waste. Since our city doesn’t compost, we’ll use the backyard compost bin as much as possible. 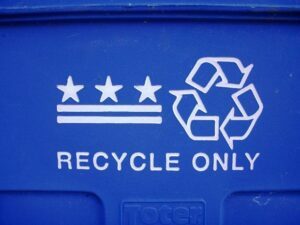 Recycle all paper, and as much plastic and metal as possible. Reuse glass jars. Reuse plastic bags when they do find their way home. Recycle plastic bags and films at the grocery store. Use plastic wrap alternatives, like these from Abeego. They’re pricey, but work amazingly well and last a really long time. You can even refresh them by lightly warming if they start to wear out. Continue using reusable grocery bags to avoid bringing home any new bags and stop bringing as much plastic packaging home through careful purchasing. Make reusable fabric bags for most bins, which can be emptied directly into the garbage can outside and washed in the washing machine. Two per bin will allow one for washing while the other is in use. Put all wet garbage into the kitchen bin. Only dry garbage goes into the other bins. Consider this product for our kitchen bin. We’d only need one. It’s waterproof and can be washed and reused. We’ll use the hose to wash out the outdoor garbage can when it gets stinky, and put messy things like meat packaging into other non-recyclable bags, like chip bags. We were already doing many of these things, but the reusable bags are a new step. The resulting health and environment improvement will be worth the extra work. With all of our recycling and composting, we usually put out one partially full kitchen bag per week for pickup. It will take time to bring less plastic home in the first place, but that’s the next step in our journey.